Today the sun shines bright in Portland; when the sky is this crystal blue I feel myself beaming a little more naturally than usual. Is it fairly normal for the weather to have such a noticeable effect on your mental state? It’s not that I’m unhappy or melancholic when the sky is clouded with dark grey, or icy rain falls heavily, but it can be a bit more difficult to walk with a spring in my step. When the weather is this bright, when I can’t stand to wear long pants because I want to feel the unusually warm air and light breeze against my bare skin, I find myself beaming uncontrollably with appreciation and joy. I have to work just a little harder to than I do on days when the sun is smiling down on me, radiating it’s energy and comfort, from dawn to dusk. In saying that, perhaps there is a silver lining to Portland’s notoriously wet, grey weather. Maybe it intensifies the excitement and gratitude I feel when the sun finally makes it’s bold appearance in the spring. January may be the official start of the new year, but it’s not until the early weeks of March, when the sun begins to smile down with its big toothy grin, that I feel the momentum, the implications, of the new year. As winter dissipates, and the sun gradually begins to radiate more of its powerful rays from dawn to dusk, I frequently myself with a surplus of energy. My regular 8:30 PM bedtime gets pushed back later and later (oh yes, I’m quite the wild child). 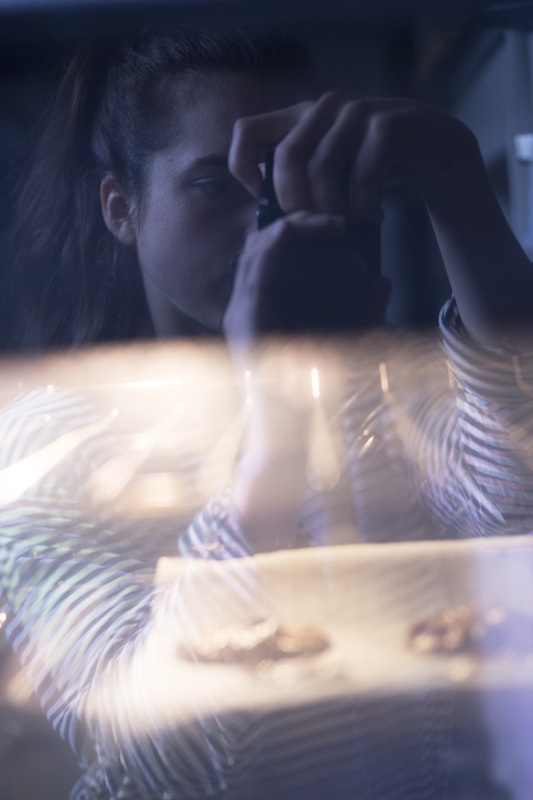 If the sun is out, I want to be up and out too, doing, baking, thinking, observing. 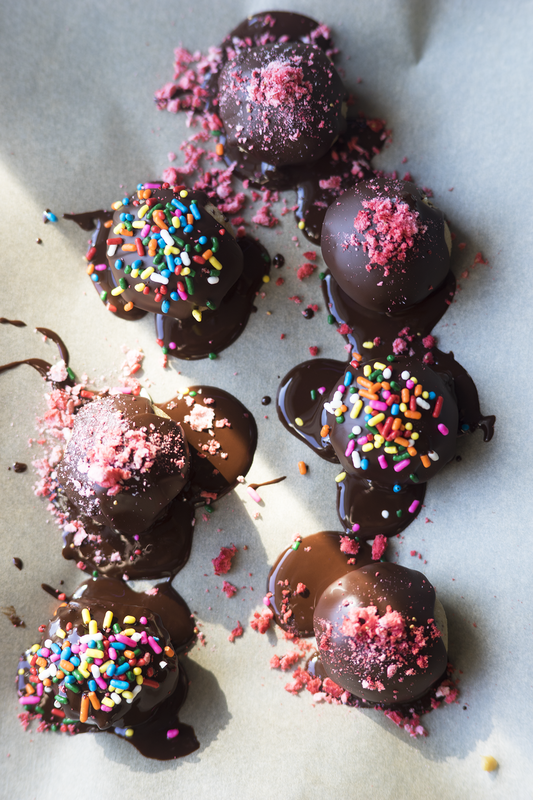 Today that surplus of energy bubbled over into colourful sprinkles and strawberry chocolate. (Oops). 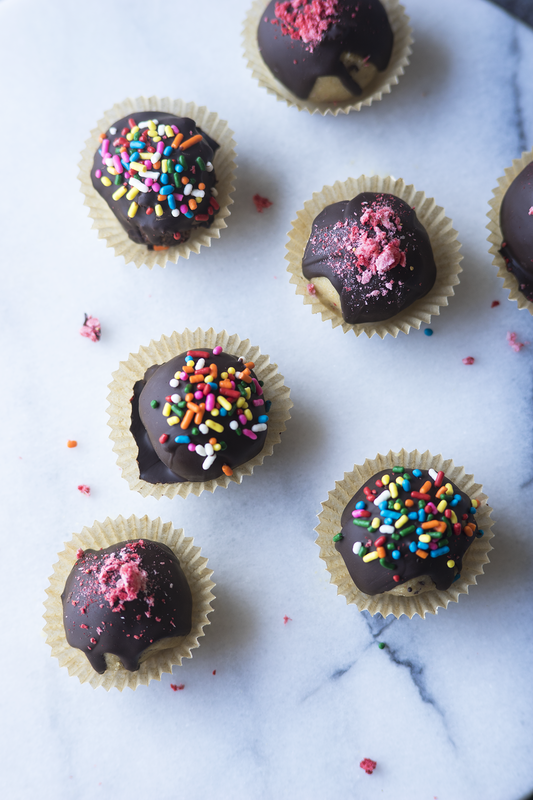 I placed these truffles on a sheet of parchment paper by the window so that they could bathe in the warm light. The sun melted them ever so slightly, leaving the imprint of their chocolate shell on my fingertips. It was a mess to smile about. The versatility of chickpeas is another thing worth smiling about. 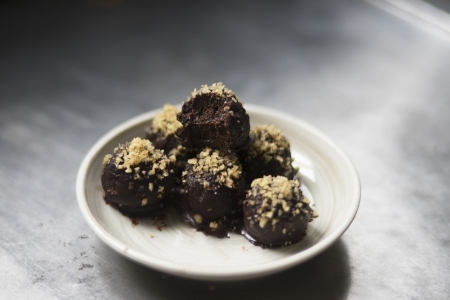 In fact, it’s almost a little comical how successfully simple it is to sneak chickpeas into a dessert as invitingly sweet as these truffles. A single can of chickpeas, along with a few heaping dollops of cashew butter (or any other nut butter of choice), and maple syrup (or honey, agave, etc. ), are creamed together to create this unconventional cookie dough. It is no doubt a little funky sounding (beans?? in cookie dough?? what!!? ), however, if you’re anything like me (aka if you have an affinity for pre-baked chocolate chip cookies), then this dough will likely leave you bewildered and reaching for a second taste test with your finger (just to double check the unbelievable cookie-dough-esque flavor). 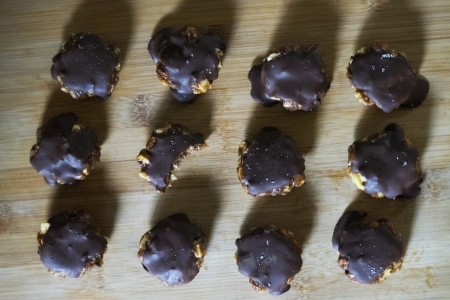 Simply roll the dough into 1-2 tbsp-sized bites, and cloak with generous drizzles of dark chocolate (we’re talking seriously generous, no-dough-in-sight, as pictured above). 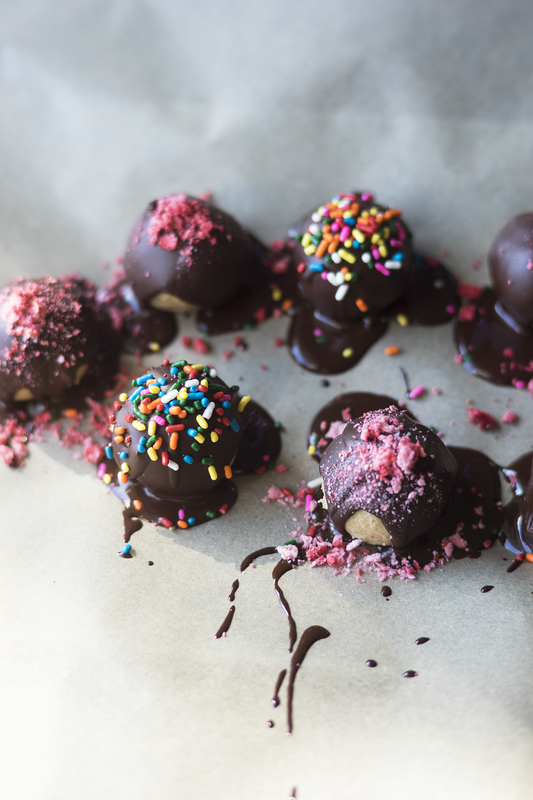 Lastly, radiate that joy, whether it’s sunny in your part of the world or not, and top these truffles off with large pinches of colourful sprinkles, crushed freeze-dried berries, and/or other fun and whimsical toppings of choice (goji berries, shredded coconut, crushed peanuts/pistachios/cashews all sound lovely!). 1. Rinse the chickpeas thoroughly (especially if heavily salted!) and lightly pat dry with a paper towel. 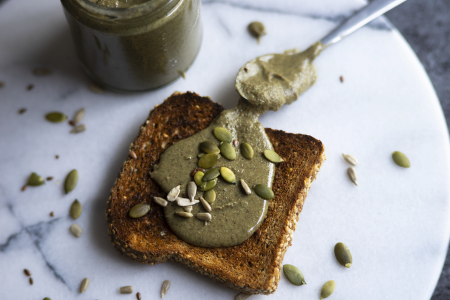 Add the chickpeas to a high-speed food processor or blender (though make sure your blender is not too large), along with the cashew butter and 4 tbsps (1/4 cup) maple syrup. Blend until smooth and creamy. Add the melted coconut oil, along with the vanilla extract, and pinches salt. Blend until incorporated and smooth. 2. Transfer the batter to a large bowl and fold through the chocolate chips/chunks. Set in the freezer for ~20 minutes (or the fridge if you aren’t trying to speed things up) to harden slightly. Once chilled, use a 1-2 tbsp scoop to dollop out balls of dough, rolling them a little with your hands to better form a ball. 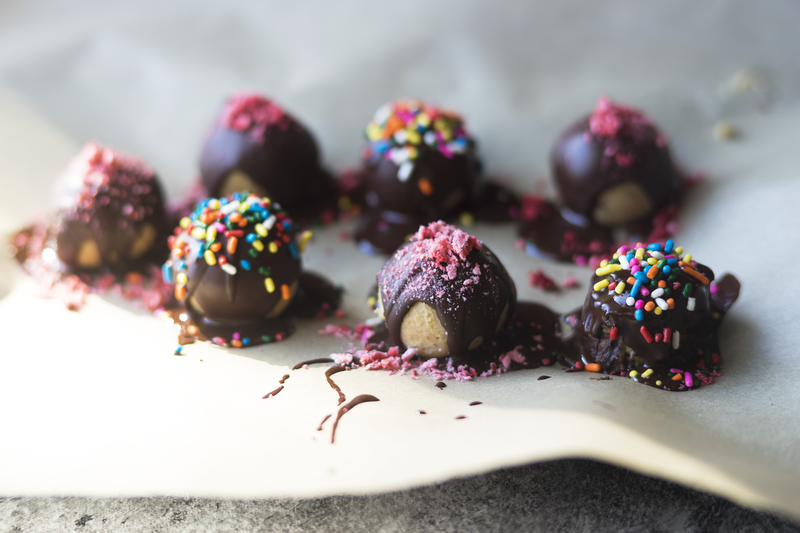 Line the dough balls on a tray lined with parchment paper or a silicon mat, and set in the freezer again to chill as you make the chocolate coating. *Recipe adapted from/inspired by Texanerin’s chickpea cookie recipe!